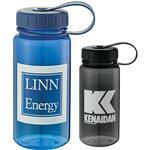 One of our best selling promotional water bottles! 24 oz. water bottle is made from PET and features a contoured body with textured grip and a wide mouth opening making it easy to clean and add ice. The polypropylene lid has a flip-open drinking spout. 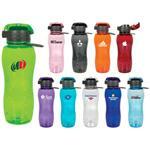 This is a sturdy well made promotional bottle that is BPA free.